To experience one’s culture you must experience their cuisine. Is that true? Is it possible to be of a culture and still rediscover that culture, as if it’s foreign? I grew up culturally American with an appreciation and inclination towards South Korean food. “Home cooking” for me was of a home I never really knew. A home I left when I was 6 years old. The flavors I yearned for were tantalizing but reminded me of nothing. Home for me, was the roof my mother had over my head. I am on a journey to unearth and reconnect with my roots. In my recent visit to South Korea, not only was my body transported to the land that birthed me; my soul experienced nostalgia as though it belonged here. The streets of Seoul were ignited with food tents selling every type of snack that will leave you overwhelmed and wanting more. At nightfall in December, the food heat-lamps illuminate the cityscape with an amber glow drawing in cold customers looking for a warm haven. 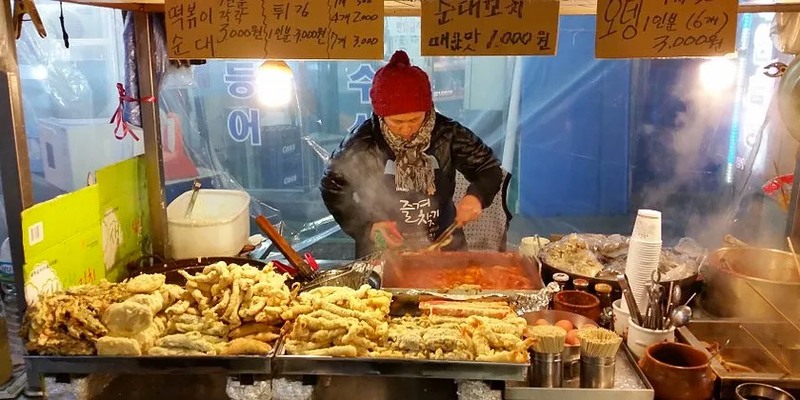 Two of the most popular street foods you will find in Seoul are Odeng and Twigim; that is fish cakes and fried snacks. I walked around, enamored by the buzzing and vivaciousness of the city. I walked, allowing the tidal waves of people to take me where the current was taking them. I soaked up the vibrations of the land, of the air, and of the people. How could a culture so disciplined and orderly be juxtaposed by pulsating life, like a heart, in love for the first time? In discovering these simple foods, I realized that one could draw commonalities between cuisines of different cultures. Its environment and the resources available dictate a cuisine. A cuisine also varies depending on the artist preparing the food. Ultimately, when food is prepared at home, no matter of which culture, it is made with love, care, and pure intention of nourishing and feeding the family. This thought took me back to my mother’s kitchen. Her food reminded me of nothing of Korea. But I now know that the love in her heart, the love she poured into the meals she had prepared for me, that love is universal and eternal.